Museum Wed. thru Sat. : 1PM to 4PM. Dr. P.L. Hathcock was born on December 31, 1878 in Sulphur Rock, Arkansas. He died in Fayetteville, Arkansas, August 27, 1969. His father was a doctor and when they moved to Harrison, AR, young P.L. became interested in his father’s work and after finishing high school he went to Nashville, Tennessee, where he attended Vanderbilt University Medical School. He graduated in 1901, then went to New York City University to attend postgraduate school in medicine. He returned to practice with his father for a short while. In 1902 he moved to Lincoln, Arkansas and set up the town’s first medical practice. He stayed for 18 years then moved to Fayetteville. His first Fayetteville office was over the First National Bank building. Later he established the Hathcock clinic and continued his practice there until his retirement when he was well into his 80s. During these years he delivered more than 5000 babies. Dr. Hathcock married Sue R. Kelton on November 10, 1901. They had three children, Karolyn Sue, Preston Loyce, and Alfred H. Hathcock. Both sons became doctors. This meant three generations of Hathcock doctors cared for Arkansas people over many years. At the time of Dr. P.L. Hathcock’s death he had six grandchildren and seven great grandchildren. 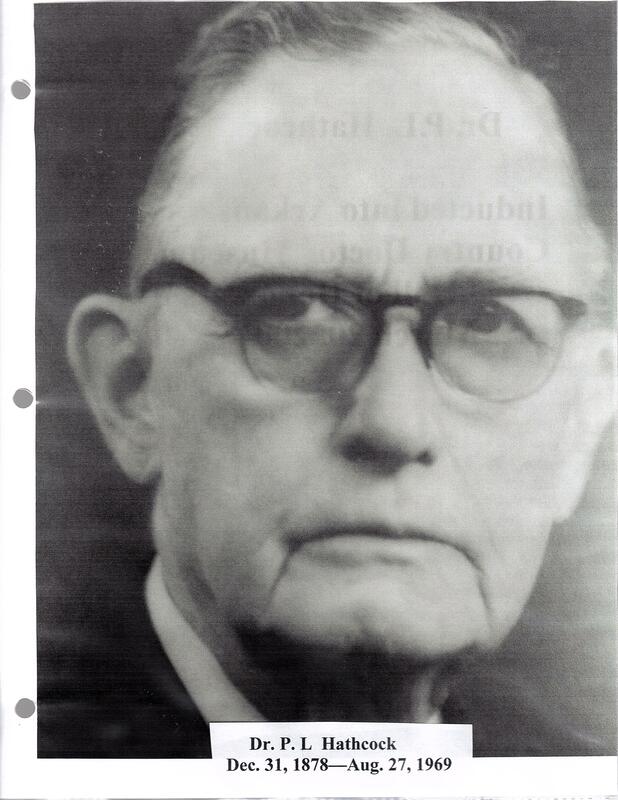 In 1961, he was named Distinguished Citizen by the Washington County Historical Society and was listed in the Exchange Club’s “Book of Golden Deeds”. He was a 50-year member of the Lincoln Masonic Lodge and was Worthy Patron in 1915, 1916 and 1921. He was also a 50-year member of the Fayetteville Lions Club. Dr. P.L. was an active member of Central United Methodist Church, and served on its Board of Stewards and Board of Trustees. He was awarded an honorary membership of the Board of Trustees at the time of his death. Professionally he was a member of the medical staff at Fayetteville City Hospital, and past Chief of Staff at that institution, was on the staff at Washington General Hospital and served as health officer for Washington County for several years. His support of his professional organization spanned more than 50 years. He was honored for his 50-year membership of the Arkansas Medical Society and named “Distinguished Arkansas Physician”. To arrange a group tour during this time call above number.